Steve Bruce was the first to join the club in 1987 after captaining Norwich City to a 5th Place finish in the 1986-87 season. Just short of his 27th birthday, Bruce cost the Manchester Club £800k and made his debut in a 2-1 win over Portsmouth on December 19th. He's been described as the best player never to have been capped by England, joining the likes of Billy Bonds and Julian Dicks (what?). Gary Pallister joined two seasons later for £2.3m which was then a national record for a defender. Like Bruce, he also helped his club to promotion, but as soon as Middlesbrough headed back down, it was just a matter of time before the England International moved on. Five years Bruce's junior, he signed for United at the age of 24. In the 1992-93 season, the two of them formed the solid foundations at the back that led the club to their first English Title since Matt Busby's team in 1967. Fast forward to 2002 and it was Rio Ferdinand breaking transfer records as he became the most expensive British footballer of all time and the most expensive defender in the World, for just short of £30m as he left Leeds United. Aged just 21, he was joining the seven time Premier League Champions following an impressive World Cup. And finally, Nemanja Vidic joined the Red Devils in the January 2006 transfer window for a bargain £7m from Spartak Moscow. Whilst he was joining the biggest team in the country, they had failed to win the title since 2003. I'll only be looking at the games they played together as partnerships, to see which pair performed better. When looking at League Games, and in keeping with the theme of the site, I'll be ranking the opposition by Bottom 6, Middle 8, and Top 6 - to get an idea of how they performed in the big games. The workings are available in the Rules & Workings menu above. As they're still playing and will make this post instantly out of date, Ferdinand and Vidic's records are only taken up to the end of 2012-13. And so onto the stats. Want to check a successful defence? Well surely goals conceded per game is the obvious place to start. As partnerships, in all competitions, Bruce and Pallister (Brullister? Pace? Neither?) played a whopping 317 games together, compared to Ferdinand and Vidic's (Ferdic? Vidinand? Okay, I'm sorry), surprisingly low 183. Considering they've been at the club together for close to eight years, that's quite a low number. 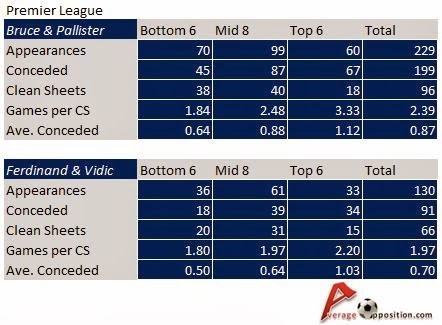 Both partnerships conceded less than a goal per game, with the newer partnership on top with just 0.72 goals conceded per game, to Bruce and Pallister's 0.89. It should be remembered however, that Ferdinand and Vidic only ever played in a title chasing or title winning team. Bruce and Pallister started playing together in 1988-89, finishing 13th, followed by an 11th placed league placing in the following year. The lowest Ferdinand and Vidic finished is 3rd. 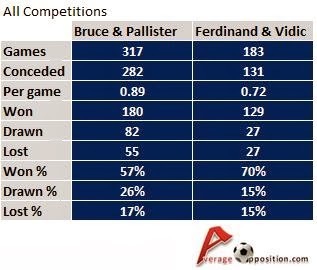 Bruce and Pallister had a decent 57% win rate compared to Ferdinand and Vidic's 70%. A straightforward victory for the more recent partnership, albeit with a caveat of the teams they came into. After goals conceded per game, clean sheets are perhaps the most telling statistic for a defence. And both pairs have a very impressive number - the older duo keeping over 100 together compared to Ferdinand and Vidic's 92 in all competitions. Once again, when taking into account the number of games played, the current Man Utd partnership come out on top, with a clean sheet every 1.99 games in all competitions. It's easy to see why they've won so many league titles, and reached three Champions League Finals in four seasons. You can point to the quality of the teams that they played in again, but to counter that, Bruce and Pallister had a shield of Ince and Keane in front of them for two full seasons (1993-95). Compare that to Michael Carrick since 2006 as the predominant holding midfielder, and the current pairing play in a more open team. As mentioned above, the idea behind the site is to pick out big game players - so how did the two pairs do when separating the better teams. There are notable games to pick out, such as the aforementioned Champions League Finals (no clean sheets for Vidic and Ferdinand), or the 1991 Cup Winners Cup victory against Barcelona (2-1), but it's difficult to quantify which games should be included, so with that in mind, I'll look at the league games. I've kept the Top 6/Middle 8/Bottom 6 split to check the range of opponent, but it's worth noting that Bruce and Pallister played in some league seasons containing more than 20 teams. Where that is the case, the Top 6 and Bottom 6 will remain, but the middle group will increase. No surprises here, with a clear win in every field for Ferdinand and Vidic. 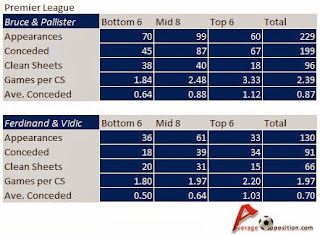 They let in a miserly 0.7 goals per match in the Premier League, and in the big games, it's close to just one goal per game when they play together. That's not to say that Bruce and Pallister had a poor record, far from it. With only 0.87 goals conceded per game, it was one of the great defences - and it's worth noting that they played almost 100 more games together in the League. Ferdinand and Vidic also kept clean sheets more often, with one every 1.97 games, and only 2.2 games against the Top 6 teams - compared to a clean sheet every 3.33 games against the Top 6 for Bruce and Pallister. So once again, it's Ferdinand and Vidic on top. Well well well. That certainly evens things up. Now, in almost an identical number of games, they're stats are pretty close - with only 0.78 goals conceded per game, and only 2.20 games per clean sheet. However, Ferdinand and Vidic still edge them out in the biggest games - the games that you need to win in order to win the league - against the Top 6 rivals. They've kept 5 more clean sheets than their predecessors - though Bruce and Pallister can point to a lower goals conceded number of 0.97 to 1.03. It's still favouring Ferdinand and Vidic, but it's a lot closer. Other big games? Well if I delve into the AverageOpposition.com mega mainframe then by choosing all Finals (excluding Charity/Community shields), Bruce and Pallister have clean sheets in two FA Cup Finals (Palace and Chelsea), the League Cup (Forest), and the Super Cup Final against Red Star Belgrade. Ferdinand and Vidic in response have two clean sheets in Finals - both League Cup (Wigan and Spurs). They each have individual clean sheets, but this is about partnerships - like Riggs and Murtagh, Laurel and Hardy or John and Edward. Not really a measure of defensive brilliance, but it's worth noting Bruce's value to the team with his whopping 51 goals - some vital in winning trophies (such as that Sheffield Wednesday brace). Pallister (15), Vidic (19) and Ferdinand (8), don't really come close in this regard. All of which helped Bruce in his "Cult Hero" with the fans. In fact, this is an area where Bruce and Pallister definitely have the upper hand, both having ended the long wait for the League Title for the Manchester Giants. In terms of opposition, you could argue that the quality of forwards has changed, but it's hard to quantify. For every Klinsmann and 90's Alan Shearer for Bruce and Pallister to face, there's been an Henry or a van Persie for Ferdinand and Vidic. Normally I find these things end in a draw, and whilst this one is very close, the stats favour Ferdinand and Vidic. Even when looking at the seasons when Bruce and Pallister were in a title challenging team, the stats still favour the latter partnership. The Ferdinand-Vidic Partnership wouldn't have existed if it weren't for the success of Bruce and Pallister but they've built on that early Manchester United success to bring it to another level - most notably in Europe. It's also worth noting as mentioned above that the Bruce-Pallister partnership had a shield of Keane and Ince for two seasons. I'm well aware that Stats aren't everything, and can indeed be used to prove most arguments, so make of them what you will!